Landburn 7-pc. Dining Set Simple in its presentation, but thoughtful in its subtle details, the Landburn 7-piece dining set is a classy addition to any dining room. Its rustic brown finish is timeless, especially when paired with clean-lined chairs featuring nailhead trim and neutral polyester fabric. Plus, an 18-inch leaf ensures you'll have plenty of room for guests. Simple in its presentation, but thoughtful in its subtle details, the Landburn 7-piece dining set is a classy addition to any dining room. Its rustic brown finish is timeless, especially when paired with clean-lined chairs featuring nailhead trim and neutral polyester fabric. Plus, an 18-inch leaf ensures you'll have plenty of room for guests. L: 60" x W: 42" x H: 30.5"
Dining chairs feature a polyurethane-foam-padded seat and back covered in soft and durable, 100% polyester upholstery for a stylish finishing touch and extra comfort. I feel compelled to give this dining set purchase a great review due to the fact that the whole experience of my purchase was great. My salesperson Elizabeth C. at the Stroudsburg PA store was very friendly but professional. I am very pleased with the product I purchased I even put it together myself to make sure no corners where cut. The experience turn out to be effortless and very satisfying. I will definitely return for future purchases. It is a beautiful dining set. I have gotten plenty of compliments on it. I brought a light rug to go under it since I have dark wood floors and the table looks great. The only downside is that the chairs are a little stiff However probably with time they will soften up a bit. I love this set. The size is perfect for my dining space. The chairs are sturdy and comfortable. These chairs are very wlwgant and sturdy. The accented studs as to its beauty. The color is absolutely magnificent. No need to worry about that person wearing dark colored jeans. This table with six chairs looks wonderful and is very comfortable. The delivery was done quickly and expertly. This would be a great purchase for anyone needing a good-looking and well-made set. Recommend this to every one,we loved. Very happy, first, with the gentlemen that delivered it. Very polite, respectful and punctual. The dining set fits perfectly in the space next to the kitchen. The color is just right and coordinates well with our furniture. The server fits very nicely in its place. It is not too overpowering. We will have extra storage space for our wines, glasses and liquors. I have purchased through you several times and have already pleased. Always use the protection plan and if there is a problem the service is professional! Extremely satisfied. I have 1st most of my house with Raymour and Flanigan and have always been Satisfied. Love the quality of the furniture the delivery is always fast. the salesman and customer service are always willing to help..
Our old dining room set was almost 40 years old and due for replacing. We went to several store but couldn't find what we were looking for. Finally stopped in at Raymour & Flanigan and glad we did. We found this set and fell in love right away. The salesman was so accommodating and helped us change a few things. The set was delivered and looks so beautiful with all 8 chairs. We took two chairs out and it's a little less cramped but when company comes we can add the two extra chairs. We are getting a glass tabletop to help preserve the beauty of the table. Very nice set. Well built, looks like we hit the mark with appearance and quality. Fast delivery and set up. Look forward to many years at this table. We bought this set after looking at several other ones in the sore. So happy with it. 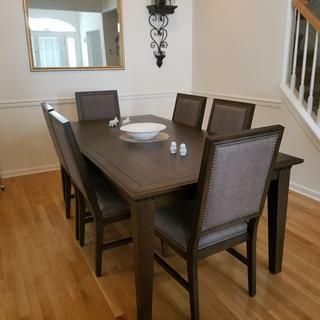 Very sturdy and looks great in our dining room. Set has a Modern look, however the chairs are not comfortable, it is appropriate for formal events. Can 6 chairs fit under table without leaf? BEST ANSWER: Thank you for sharing! They will fit without the leaf. What's the best size area rug for this table with leaf and 6 chairs? BEST ANSWER: Hello Kathy! The recommended size rug would be a 7'9 x 10' to fit the Landburn 7-piece Dining Set completely. The two rugs I have attached are the actual rugs we use in our room shot images, if you are interested. can 8 chairs fit on each side with the leaf? BEST ANSWER: I would recommend 3 chairs maximum on each side when the leaf is installed. What color is the chair fabric? BEST ANSWER: The fabric is a gray color. What is the weight limit on chairs? BEST ANSWER: The maximum weight capacity on the Landburn Dining Chairs is 250 lbs. What color is the table .? BEST ANSWER: The Landburn dining table is finished in a Rustic Brown. How many chairs can the table fit with the leaf in? BEST ANSWER: With the leaf included, the Landburn Dining Table will seat six comfortably.